95% of my wardrobe consists of yoga pants, jeans, t-shirts, && hoodies. I'm a casual dresser. I prefer to be comfortable. Jess always laughs at me because I'll step out in yoga pants, tennies, a hoodie... then have a full face of makeup including false lashes. I don't care. If my hair is done && my makeup is on point, why does it matter what I'm wearing? Aha. Breaking it down even further, 99% of my t-shirts are nerd shirts or band/concert tees. One of my favorite places to find nerd shirts is Shirt Punch. Every day at midnight Shirt Punch puts up new t-shirts on their page that are $10. Each day there's a different design. I check them religiously every day. 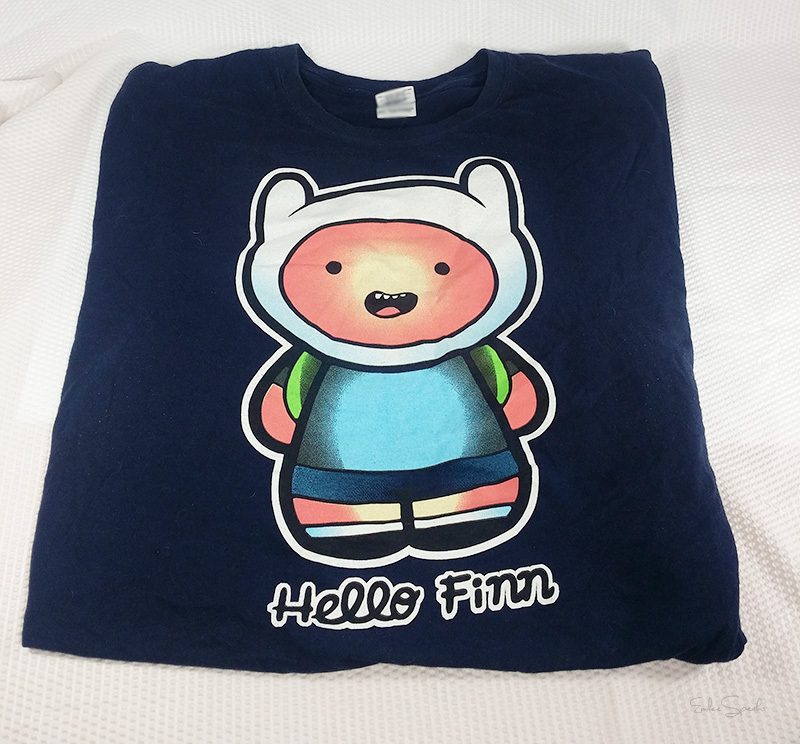 That's where I got this Hello Finn t-shirt! Adventure Time && Hello Kitty, it doesn't get much cuter than that. I have a bunch of nerd shirts from my "t-shirt of the day" addiction, so I thought I'd start sharing them with you. This one is my current favorite. The t-shirt fits perfectly, the material is soft, it's just perfect. That's why I chose this one to share today. It's been my go to grab && go t-shirt lately. I have way too many nerdy shirts but I can't stop buying them! Ahah! I'm just really whiny about being uncomfortable. I MUST be comfortable. 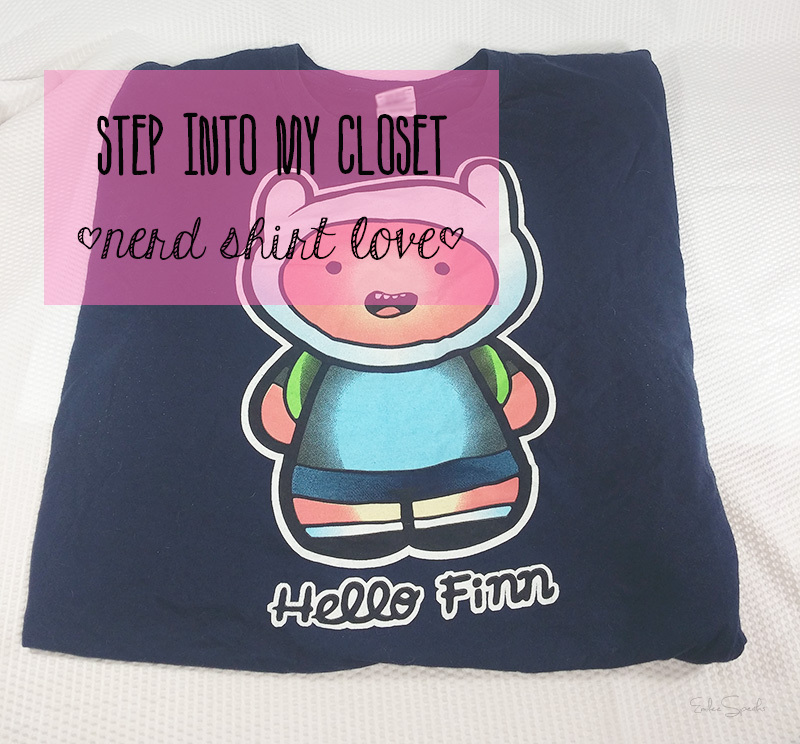 Pretty much all my tees are geek themed as well! Have you checked out Tee Magnet? It gives you the majority of the daily tee sites (including Shirt Punch! ;) ) in one place, so you don't have to check seven different websites to see the daily deals! I love it. I stopped checking daily once I realized just how many shirts I was ordering though haha! Yes I love TeeMagnet! Such an easy way to see all the daily shirts.